Network Rail, formerly Railtrack, has been found guilty of breaching health and safety legislation in the run-up to the Hatfield crash. But three ex-Railtrack managers, and two former employees of Balfour Beatty, the firm which maintained the line, were cleared at the Old Bailey. 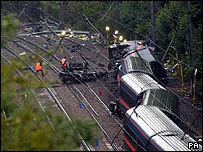 Four people died when a London to Leeds express train hit a cracked rail and left the tracks on 17 October 2000. Prosecutors said the crash resulted from a "cavalier approach" to safety. Sentence will be passed in October. Network Rail had denied the charges, as had the former Railtrack executives - Alistair Cook, 52, Sean Fugill, 52, and Keith Lea, 55 - and the officials from Balfour Beatty - Anthony Walker, 48, and Nicholas Jeffries, 50. The jury had been told the 117mph crash, which also left 102 people injured, was caused by a cracked section of the track. The court heard a backlog of essential work had been allowed to accumulate, and that the rail had been identified for repair 21 months earlier. Defence lawyers had told the court the executives were being used as scapegoats for a "botched and unworkable privatisation" in an under-funded industry. As they left court, the five executives expressed sympathy for victims of the crash but maintained their innocence and questioned the decision to prosecute them. Mr Cook, then one of Railtrack North Eastern's managers, said that in a career spanning 35 years, "I have always tried to do the best I could to make the railways a safer place". Gary Fellows was one those hurt. He told BBC News he was glad the case had gone to court. "It is a good verdict. There had to be some kind of legal process of people brought to account to some extent." Balfour Beatty admitted a charge under the Health and Safety Act but said it did not accept all the facts of the case the prosecution had outlined against it. The case has renewed the debate over the legislation dealing with corporate manslaughter. Safety campaigner Maureen Kavanagh, whose son Peter, 29, was killed in the 1997 Southall crash, said she was sickened by the decision not to press ahead with corporate manslaughter charges. Ms Kavanagh, who runs the Safe Trains Action Group, said: "It is not about holding up people as scapegoats, it is about people doing the job they are supposed to do, having a duty of care and being accountable." A new law making it easier to prosecute firms in the wake of major disasters is currently being considered by Parliament. "There is a recognition that the law as it stands at the moment is problematic," said solicitor John Pickering, who represented the families of the four who died. "There is a tension between wanting to create a system for corporate accountability so the victims think there has been a criminal level of redress, and for business to know where the borderlines are and how to conduct themselves so not to land in difficulty." The crash left Railtrack with a £733m bill for repairs and compensation to train-operating companies and helped trigger its collapse. After the case, the chairman of Network Rail, Ian McAllister, said the maintenance of the railway had "fundamentally changed" since the Hatfield tragedy. RMT union general secretary Bob Crow said safety on the trains had improved since Network Rail had replaced Railtrack, but urged a return to public ownership.